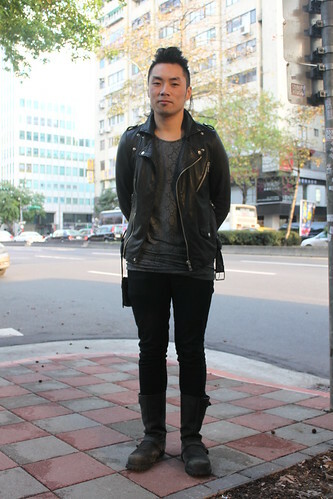 Evan was walking by Zhongxiao East Road with a friend when I saw him and his rocker outfit caught my atention. He told me he lives in Hong Kong and that he was visiting Taipei for a few days. Evan was wearing a black leather jacket, a gray T-shirt with snake print, black trousers and black boots, a little bit worn out. No complements other than a small black bag. I also like that he combed his black hair in a tupé. Love his boots!! It's a good grunge look, luckily it's cold enough to wear that in Taipei! Great street style inspo from Asia.